Upma is the most common breakfast in south indian homes. There are many varieties in upma. 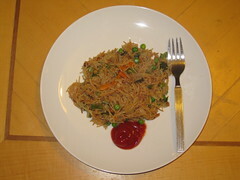 Let see about vermicelli upma. Its a quick dish which is suitable to make as breakfast. 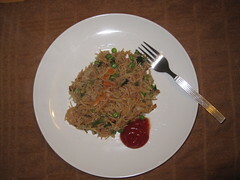 Roast vermicelli in dry pan till little brownish. Heat oil in a pan,add mustard,cumin seeds and channa dal. Fry it and add curryleaves. Now add onion and salt and fry till transulent. Add ginger and greenchilli and saute well. Its time to add carrot and beans and fry well . Add water and make it to boil and check salt. Now add roasted vermicelli and frozen peas. Stir it frequently until vermicelli is cooked .Upma is ready. Upma can be served with any type of chutney and sugar. Do mention about the measurements or proportions of water to vermicelli da..